Home NEWS Is Maendeleo Chap Chap slowly gaining ground for 2022? Is Maendeleo Chap Chap slowly gaining ground for 2022? Maendeleo Chap Chap Party leader Machakos Governor Dr. Alfred Mutua and the August 2017 MCCP candidate for the Embu gubernatorial seat Lenny Kivuti. 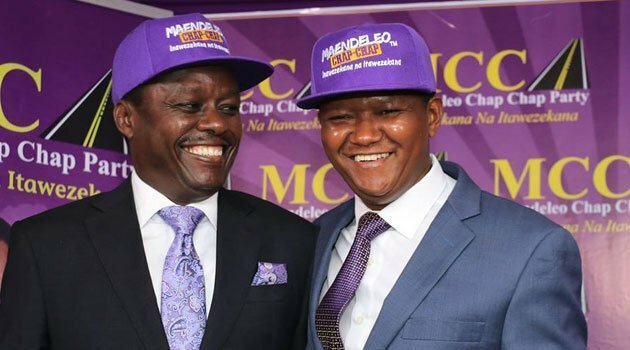 Machakos Governor, Dr. Alfred Mutua's Maendeleo Chap Chap Party (MCCP) on Thursday received a major boost in Embu after its gubernatorial candidate successfully petitioned against the election of Governor Martin Wambora. High Court Judge William Musyoka nullified Wambora’s August 2017 win on the grounds that there existed massive irregularities that compromised the integrity of the whole process. The MCCP candidate in the race was Lenny Kivuti. The court further ordered IEBC to pay Kivuti sh. 2 million and Wambora sh. 1million. This follows another case in a Narok court where a MCCP MCA Sialo Natanya Tasur was awarded the county assembly nomination slot that had been given to a KANU candidate Anne Potisho Kapasar. Deputy registrar Wilbroda Juma said MCCP was entitled to one nomination seat of the 13 available going by their performance in the August polls. A fortnight ago, Governor Mutua emerged victorious after the high court dismissed a petition filed against him by Wavinya Ndeti. Buoyed by his court victory, Mutua has now strengthened his resolve to contest the presidency in 2022. The governor has also consolidated his support by wooing Wiper members in the Machakos County assembly who have promised to closely work with him to spur growth in the county and roll back poverty ahead of completing his second term and taking a stab at the highest office in the land. Since his entry of into elective politics, Governor Mutua has done a lot that the people of Ukambani especially those from Machakos County appreciate. The contributions in terms of development he has done to the people of Machakos such as construction of roads, creation of more job opportunities to the youth and drilling of boreholes to reduce the scarcity of water in the region. All this developments and many others have earned him a great name in the region. On several diverse occasions, sections of Ukambani leaders have announced their support for the Machakos governor to become the region’s political torchbearer. In the latest episode, the decision by NASA co-principal Kalonzo Musyoka to skip Raila Odinga's swearing-in angered some influential groups in his Ukambani backyard with representatives of the Ukambani national youth council expressing their disappointment at Kalonzo. The council declared ‘a shift of political allegiance’ to Governor Mutua.